See the new iPod TV commercial. Introducing iPod. Watch Steve Jobs keynote. Learn more about iPod in this video. Presenting iPod. The first MP3 player to pack a mind-blowing 1,000 songs and a 10-hour battery into a stunning 6.5-ounce package you can literally take everywhere. But iPod isnt just a revolution in portability, its also a revolution in simplicity. Just plug it into your Mac and all of your iTunes songs and playlists are automatically downloaded into iPod at blazing FireWire speed. With iPod, its that easy to take your entire music collection with you wherever you go, in the pocket of your choice. Pocket-sized (2.43 by 4.02 by 0.78 inches) and ultralight (6.5 ounces) for true portability, the iPod is a marvel of audio engineering wizardry. At just 6.5 ounces, it weighs appreciably less than the stack of CDs it can store music from. When you first plug iPod into your Mac, all of your iTunes songs and playlists are automatically downloaded into iPod at blazing FireWire speed. Then, when you add new music or rearrange playlists in iTunes, simply plug iPod back in and its automatically updated in seconds. It simply doesnt get any easier or faster than this. You can download an entire CD in less than 10 seconds. Or 1,000 songs in under 10 minutes. Plus, iPod automatically charges whenever youre connected and your Mac is on. 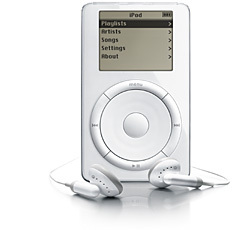 The iPod has a large, high-quality liquid crystal display (LCD) for viewing up to six lines of text. And the LCD features a white light-emitting diode (LED) backlight for clear visibility in low-light situations  indoors or outdoors. iPod automatically charges using the FireWire cable connected to your Mac while you are transferring music. You can also recharge using the included FireWire cable and AC adapter when youre on the go. Music shown is not included. The Apple Store offers convenient online ordering 24 hours a day, every day. This update adds support for iPod volume names up to 255 characters and for additional languages, including Brazilian/Portuguese, Danish, Finnish, Norwegian, and Swedish. iPod comes with Apples award-winning iTunes 2 software. Automatic synchronization keeps your iPod music and playlists up to date. And whenever you add new music or modify your playlists in iTunes, simply plug the iPod back in and the changes will be automatically updated in seconds. Also in iTunes 2, you can rip MP3s, create playlists and burn custom CDs all from one refreshingly simple interface. And now iTunes 2 offers even more features  like MP3 CD burning, crossfading and an equalizer. Access to 1,000 songs is under your thumb. Browse your music by playlist, artist or song in seconds with iPods unique and incredibly easy-to-use scroll wheel. A high-output (60-mW) amplifier provides CD-quality sound with a wide dynamic range. The result? Deep, pulse-pounding bass and sharp, crystal-clear highs. Even the headphones that come with the iPod are phenomenal. Theyve been engineered with Neodymium transducer magnets for enhanced (20-20,000 Hz) frequency response and stunning, high-fidelity sound. Pocket-size and ultralight (2.43 by 4.02 by 0.78 inches; 6.5 ounces) for true portability, iPod travels with you.